While I’ve never been a principal in a manufacturing business, I’ve always envied the predictability, control and ability optimize that’s inherent in modern manufacturing processes. For years I’ve only been able to leave it at envy because conventional wisdom dictates that marketing, lead generation and sales can never operate with such precision. I’m sure if we went back to the days when some caveman was carving widgets from stone many "thought-leaders" exclaimed that widget making was an art as well, but today we know better. Today I find myself (and our teams) using modern manufacturing as the metaphor to design customer & revenue acquisition processes. When you view sales and marketing through the lens of manufacturing and supply chains, you’ll quickly see that the best way of looking at it isn’t as one manufacturing process, but instead, multiple processes that take raw materials through numerous assembly lines; with each line creating value and enhancing output. It’s so apparent that it’s easy to forget, but you can’t have a sales unless there’s a conversation first, and you can’t have a conversation if you haven’t generated the awareness, attention and engagement of a right-fit prospect/lead. It’s not enough to just get the attention of someone; you must get the right type of attention from the right person or people (all of which should be determined by your playbook). Understand that the demand generation process can occur throughout the buyer’s journey, from the epiphany stage all the way through the decision stage; therefore it’s crucial you have the right strategy in place to create the right type of engagement at the right time. Create curiosity and the desire to engage, investigate and to talk further. Remember in the demand generation phase you’re not “selling,” your helping, challenging and guiding. Mastered, this portion of your manufacturing process will generate a high-probability prospect, with an understanding of who you are, what you do and why it matters, and a commitment (and open mind) to move further with you. Another word for this is Sales Qualified Lead. Whether you call them customers, clients, guests, users, donors or the lifeblood of your business, acquiring right-fit customers is central to any business’ ability to succeed. It is crucial that a company develop a repeatable, predictable process to generate an increasing flow of high-value customers. In the end, revenue is the lifeblood of a company. 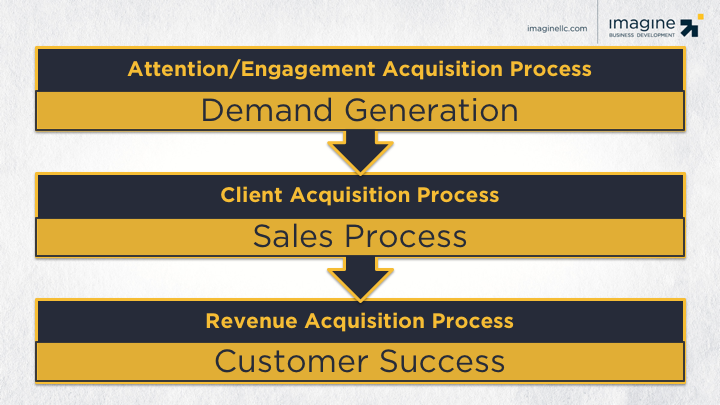 The revenue acquisition process is (or should be) a core focus of your customer success/service teams. The ability to quickly, efficiently and effectively generate and expand revenue from your customer base is a key to accelerate growth rates. Most people quickly see and understand the difference between the first process and the last two. Often they mistakenly think of the first process as marketing instead of demand generation (marketing and demand generation overlap, but they are not the same thing), there is a growing understanding of how and why treating the demand generation as a separate and defined process is the right path. However, there is still tremendous confusion and conflation between the customer acquisition and revenue acquisition processes. There’s a good reason for that. It’s easy to think of acquiring customers and acquiring revenue as the same thing after all that’s why businesses work so hard to get customers, isn’t it? If you’ve used any SaaS/cloud-based technology in the last decade, it’s a pretty good bet that you’ve benefitted from the move to a freemium model. It’s easy to forget, but “back in the day” you had to pay for technology before you could use. If you were lucky, you’d be able to get a 14 - 30-day free trial. Now, companies like Databox, Dropbox, Drift, HubSpot and even Salesforce.com provide fully functioning products to customers for free. The first freemium product I was aware of Hotmail. I remember the first question I asked myself when I saw it, “How the hell do you make money when you give it away for free?” Even today most people are confounded by the same question. I know people who are afraid to give away an idea for free in a blog post, and now companies are giving away an entire product. Didn’t our moms teach us that there’s no reason to buy the cow if they’re getting the milk for free? How does it make sense to give a real product away for free? Quite easily actually. Tech companies realized that a primary bottleneck to their growth they linkage of the customer acquisition process with the revenue acquisition process. They realized that they dramatically decrease the customer acquisition costs by giving product away for free. Once a prospect signed up, they were no longer a prospect, they became a customer, and we all know that getting revenue from customers is easier than getting revenue from prospects. This approach has worked so well that today if you’re starting a SaaS company and you don’t offer have a freemium product, you’re at a disadvantage. Their sales cycle was long, unpredictable and speculative. This company’s core service required a significant investment of both money and commitment to change. The solution was highly customized to the customer, so a lot of work had to be put up-front in designing a solution, and because of commitment required no one was ever sure the deal was going to go through until the contract was signed. The second problem was that even when the contract was signed, the time to revenue was long and unpredictable (they couldn’t even be sure there would be revenue as about 10% of the companies that signed a contract never fully implemented).After attempting several “process engineering” attempts to fix the issue, we helped them see where the chase of the bottlenecks and challenges were. While we didn’t have this model to share with them at the time, our recommendations (and the solution) were right in line with this. The typical time to revenue (the time from the contract signed to the first dollar of income) for this company was 9 - 15 months (and some stretched to as long as 20 months). The fundamental problem they were having is that they were trying to solve the entire problem in one big step. This made the sales process extraordinarily complicated for the seller, and risky (& scary) for the buyer, leading to the expensive and lengthy sales cycle. We adjusted the focus of the sales process to narrow down the overall problem they were solving. The operative question went from “What’s the problem we solve?” to “What’s the first problem we’re going to solve?” This simplified things all around and cut the sales cycle time by just under 40%, and an even more significant reduction in sales costs as fewer people and resources were needed to manage the process. Concurrently we implemented a defined customer success & expand process that focused on both successfully implementing the solution and expanding on the offering. This led to changes in how the service team was structured. They built an “expand” team responsible for managing the ongoing strategic sale that increased scope (and revenue), and a “success” team responsible for successful implementation and adoption of the solution. This resulted in shortening the time to revenue to 3 - 6 months and increased the average income (and gross profit) per customer. Five years after implementing strategy the owners sold the company for an undisclosed (but very significant) amount. While these two stories highlight some of the big strategic decisions that become clear when you view your growth through the three acquisitions model, many other opportunities for optimization and improvement present themselves as well.